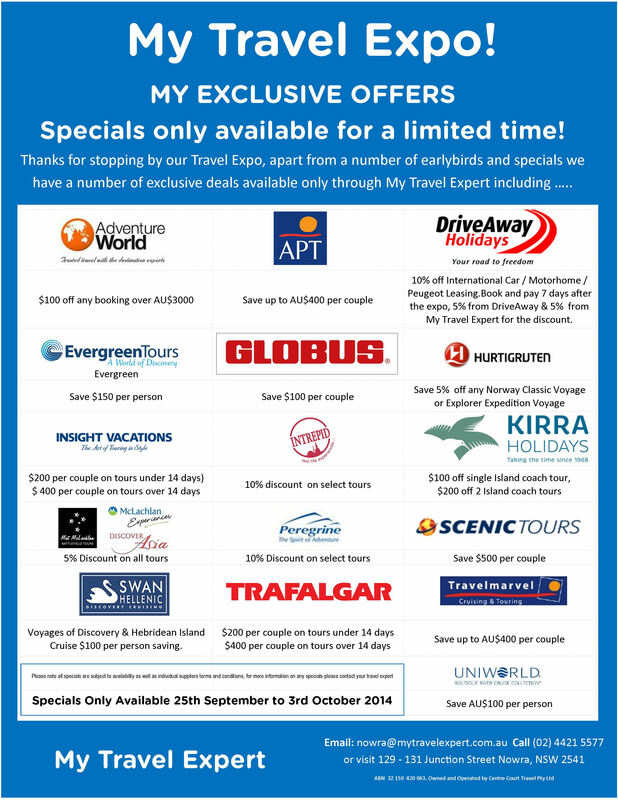 Posted on September 25, 2014, in Promotions, Specials, Tours, Updates and tagged Adventureworld, APT, Driveaway Holidays, Evergreen Tours, Exclusive deals, globus, Hurtigruten, insight vacations, intrepid, Kirra Holidays, Mat McLachlan Battlefield Tours, My Travel Expo, peregrine, Scenic Tours, Swan Hellenic, Travel Expo Deals, Travelmarvel, Uniworld, ~Trafalgar. Bookmark the permalink. Leave a comment.